No doubt about it – our native and adaptive plants put on quite a show during the heat of summer without any additional help. But, what if you want to add a little more color or diversity to your garden? For foliage color, you just can’t beat Caladiums. Not only do they love the heat, but brighten up any shady spot – yes, they do require shade. The myriad of colorful foliage colors and patterns that are available make this an even more exciting and diverse planting for summer. Even though they are planted for summer growing conditions, these plants are very sustainable for use year after year. In other words, they are annuals that are perennial in nature if you merely dig the bulbs, place them in a dry peat/perlite mix in a plastic bag, and just store them in the garage or any dark place overwinter. By spring, they are starting to sprout in the bag so just replant them and within two weeks, the color parade is on again. They are tropical plants and do require temperatures above 50 degrees. Do not leave them in the ground or exposed pots during winter. I am on my 4th year of growing Caladiums from the original source. They also reproduce fast so your initial investment will multiply. 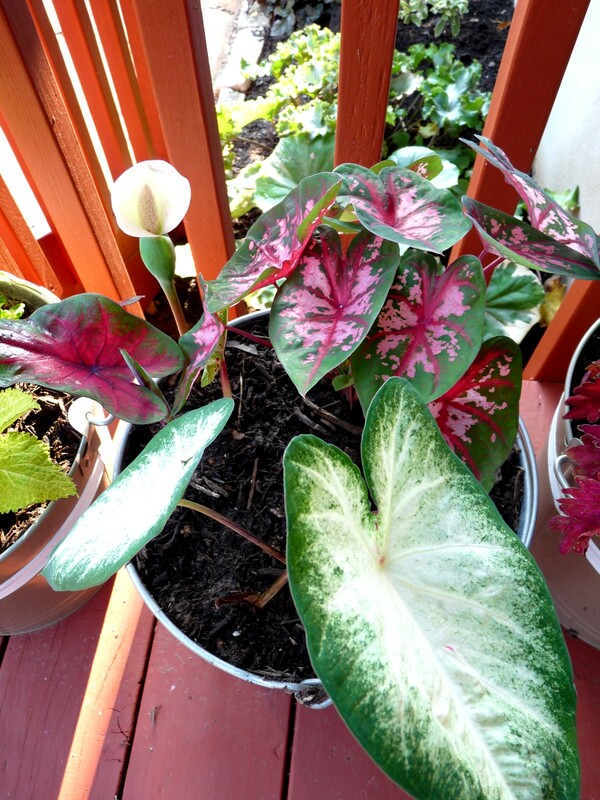 Caladiums make excellent potted plants and as such require more frequent watering than terrestrial planting. When the growing season for Caladiums is over, they are dug and replaced with something for the colder weather season. Another outstanding plant with a tremendous variety of floral color for the summer season is Bougainvillea. There are even colorful variegated foliage cultivars to go with floral perfusion of pink, magenta, purple, red, white, orange, peach, and lavender floral colors. This plant, like Caladiums, needs temperatures above 50 degrees thus requiring winter protection, but unlike Caladiums, require full sun to do best. They can be allowed to grow as a vine or pruned to grow in shrub form. Bougainvillea bloom on new growth, so pruning often encourage this. Bougainvillea like to have their soil go dry between watering. This encourages blooming. They will let you know when they need water when foliage wilts, but recovers fast with watering. I have reduced the number of tropical plants I grow and overwinter in my hobby greenhouse, but will not ever do without Bougainvillea. Bougainvillea don’t like to have their roots disturbed or be transplanted, so I grow mine in 5 gallon nursery containers and bury the entire container and plant in the ground for summer. Roots will grow out through the drainage holes and top growth will be restrained by the bounded roots, keeping this potentially fast growing plant under control. In late fall, I dig up the container, prune off the “escaped” roots and prune the plant back to the width of the container itself for overwintering. 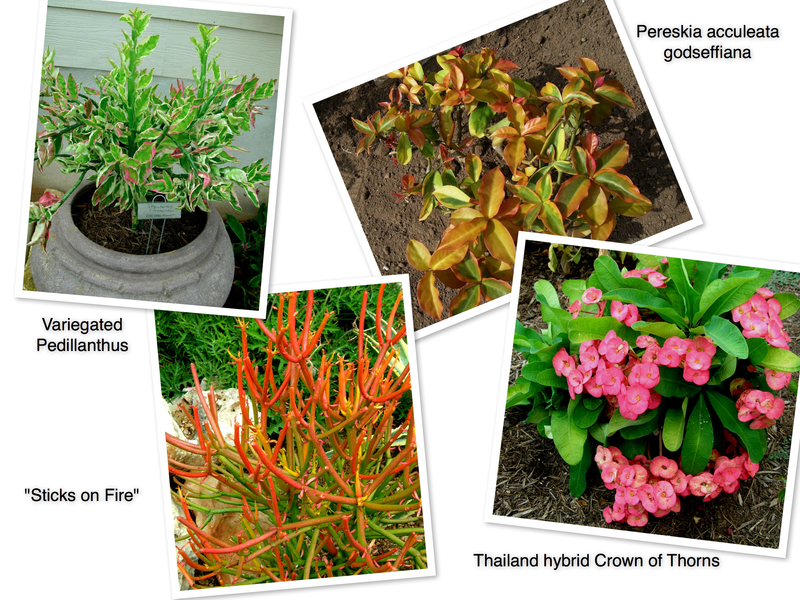 Anther tender favorites for additional color in summer include Euphorbia tirucalli ‘sticks on fire’ – aka pencil plant. This cultivar produces new growth that looks like it is on fire – orange and yellow coloring above the greener base. This plant is so easy to overwinter – just keep one branched stalk, let the sap dry, plant in a small pot and keep it above 50 degrees. It will revert to green when taken out of full sun but recolor when the full sun returns in the summer garden. Remember that the white sap of Euphorbias is toxic. You might also try Euphorbia milii Thailand hybrids) aka crown of thorns. These hybrids can produce a perfusion of colorful coin shaped flowers from white, yellow, orange, pink to red. One more to consider. Try Pedillanthus, aka zigzag plant, red bird, or devil’s backbone. The variegated form is preferred due to the added foliage color. The erect stalks, zigzagging back and forth with attractive variegated foliage takes up little garden space, and will treat you to small red bract-like blooms in summer. Once again, it is so easy to keep overwinter, like the pencil plant, being a Euphorbia, only one stalk is needed to perpetuate it the next warm growing season. They are very drought tolerant, love full sun , but will do well in light shade, plus add a different texture to your garden. 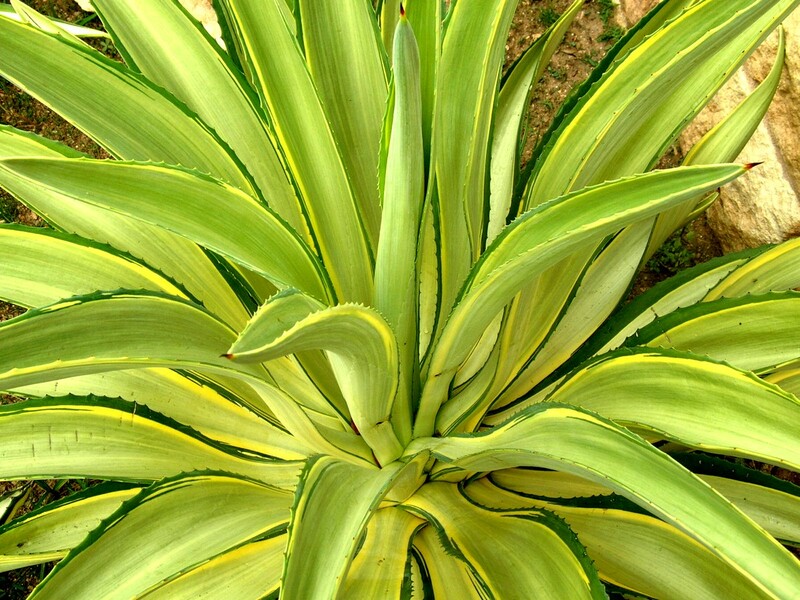 Remember also that there are many species of tropical agaves in colorful variegated forms that also can be used as potted plants or in-situ during the summer months, in full sun and heat endurance, provided they get the needed winter protection. Also, for shade, don’t overlook Bromeliads. 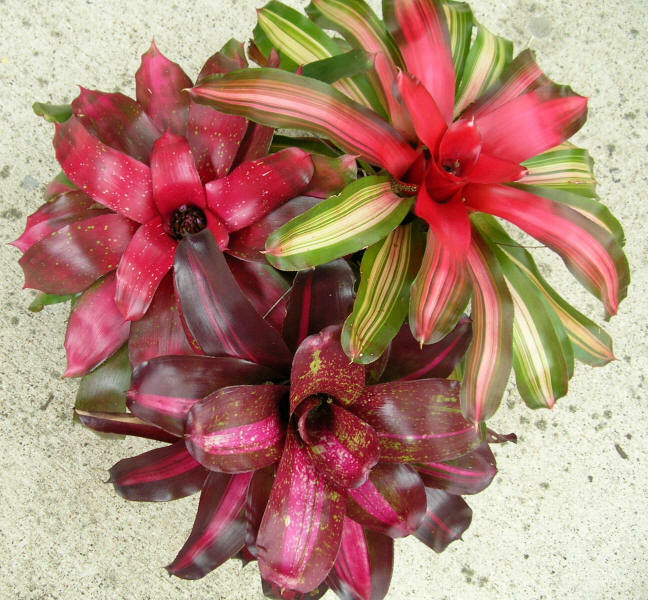 They have been hybridized so much to produce stunning colorful plants ideal for shady areas. Neoregelias do best in the heat along with Billbergias. Their colorful hybrids exceed that of Caladiums in terms of color diversity and patterns. They reproduce easily from pups at the base and take up little space in a greenhouse other protected winter location.I’m sure there are many other possibilities for adding seasonal color to your ornamental garden through use of tropical plants. But those mentioned are plants I have had personal experience and success with and would highly recommend to others. These summertime supplements never will become a substitute for our beautiful native and adaptive plants which have produced spectacular year-round color in our garden, but I consider them to be the “frosting on the cake” for gardeners.